Whether you have been a grain share member for years, just got your first grain share, or are thinking about getting one, this page has some really important information about storing your share. 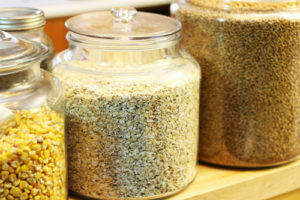 Grains are very easy to store and use. They will generally keep in whole form for 1 to 2 years at a stable room temperature. I highly recomend the use of dessicant packs in your storage containers as they will significanlty increase the shelf life of all your grains and are affordable, perfectly food safe and totally re-usable. For best keeping, do not store your grain in the attic, basement, or garage. Temperature fluctuations lead to condensation and mold growth. Please keep your share on a main floor of your house where temperature is most stable. Kitchens are best. 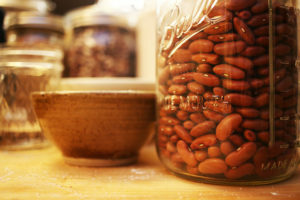 Use glass jars for storage and keep the grains on your counters and in your kitchen cupboards. Glass is moth proof, rodent proof, and more sanitary and clean than plastic, as scratches in plastic can harbor mold and bugs. If you need to look beyond your kitchen for storing extra grain, use a first floor closet or pantry space. A full share only takes up 4 cubic feet so any standard single kitchen cupboard will fit the entire thing. A combination of counter top and cupboard storage works particularly well! Mason jars are the most cost and space efficient, but Anchor hocking jars make lovely countertop storage (as pictuired above). These can be found at Bed Bath and Beyond, Target, Walmart etc…(links go to amazon). 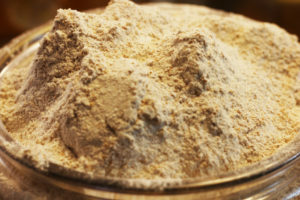 Except the cornmeal, Flours store well at room temperature for several months (January through April), at which point flour should be moved to the fridge (6-12 months) or freezer (2 years or more in a temperature stable freezer) in glass or heavy plastic containers. The cornmeal is particularly perishable and should be kept in the fridge or freezer at all times. The second most perishable items in the share are the Nothstine Dent, popcorn, and Plymouth Flint corn. These are the largest kernels and are harvested the latest in the year so they tend to have a little more moisture in them than the small grains. The cornmeal is particularly perishable and should be kept in the fridge or freezer at all times. The whole corn kernels are best kept in your fridge or freezer. If you do want to keep them at room temprtature I suggest keeping them in paper until april to help them finish drying and then move them to glass with a couple dessicant packs for further room temperature storage. Rolled oats keep at room temperature for 3-6 months in your kitchen, after which they should be moved to the fridge or freezer for longer storage. Steel cut will last the year and whole oat groats can last up to several years at room temperature. All the other small grains and beans are very dry and ready for storage in glass, even with sealed lids if you like. While it’s not necessary to wash any of your grains, you are always welcome to wash them in a few changes of water if you want to get them super clean. If you are going to cook them anyway, this adds very little time. If you are going to grind them after washing, you have to dry them thoroughly before grinding. 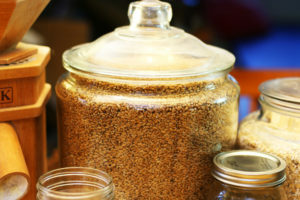 To wash your grains, place them in a container several times larger than the amount of grain being washed. Then cover by several inches of water and stir. Pour off anything that floats. Repeat until water runs clear and nothing floats. Dessicant packs are a cheap and simple way to add extra protection to your grains throughout the year. They are reusable and cheap. Add one to each jar and worry not! Pantry moths are attracted to things like sugar, pasta, flour, and other edibles stored in your cupboards in paper or plastic bags. The moths eat through the bags and proliferate sneakily. Proliferation is eliminated simply by storing all your edibles in glass or heavy duty plastic. If moths do get in your grains, you can always pop them in the freezer for a week and all moths will be eliminated.